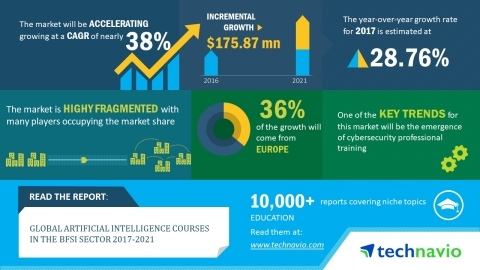 According to the market research report released by Technavio, the global artificial intelligence courses in the BFSI sector is expected to accelerate at a CAGR of almost 38% during the forecast period. The increasing use of AI technology for cost reduction and quality research is one of the key factors triggering the growth of the market. This research report titled 'Global Artificial Intelligence Courses in the BFSI Sector 2017-2021' provides an in-depth analysis of the market in terms of revenue and emerging market trends. It also includes an up-to-date analysis and forecasts for various market segments and all geographical regions. In 2016, the blended learning segment accounted for 59% of the global market. The blended learning methodology enables course providers to use digital tools such as fintech software for the demonstration of its involvement in effective knowledge. The emerging cybersecurity professional training is an emerging trend in this market space. Considering the dynamic growth and complexity of fintech financial ecosystem in the BFSI sector, it is inevitable to ensure the security of financial solutions against cyber-attacks. Vulnerabilities will be identified to be exploited and to gain unauthorized access to user accounts. Considering risks, fintech firms are increasingly focusing on having automated cybersecurity solutions for the banking and investment sectors. Fintech firms such as Bussmann Advisory are also increasing their spending on ensuring cybersecurity. They have also increased their budget on technology upgrading. Advances and the implementation of AI and machine learning will improve vigilance cycles in the cybersecurity domain, to identify cyber risks.